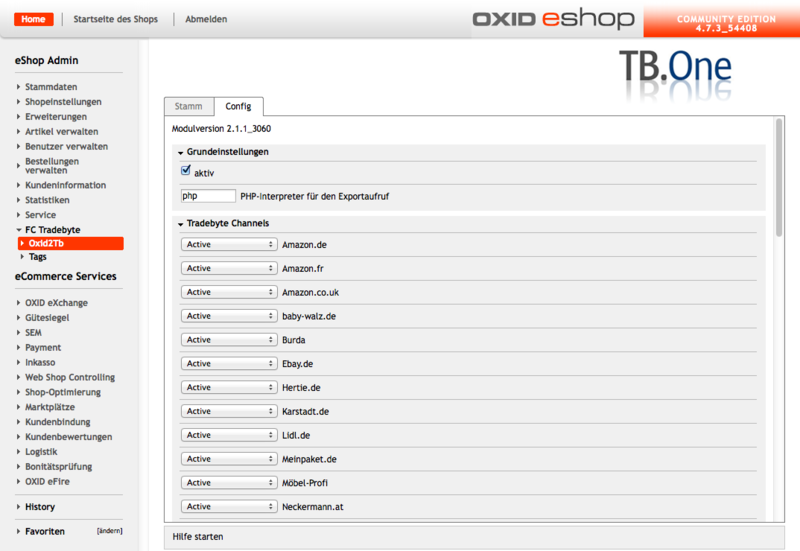 OXID eXchange | FATCHIP OXID 2 Tradebyte Connector 2.4.1 Sourcecode | Stable | EE, PE | 4.7.x - 6.1.x | Module, Themes, Language Packs direkt herunterladen! The FATCHIP OXID 2 Tradebyte Connector links your OXID eShop with Tradebyte. Via Tradebyte or Tradebyte TB.One you are able to sell your products on numerous channels and platforms. 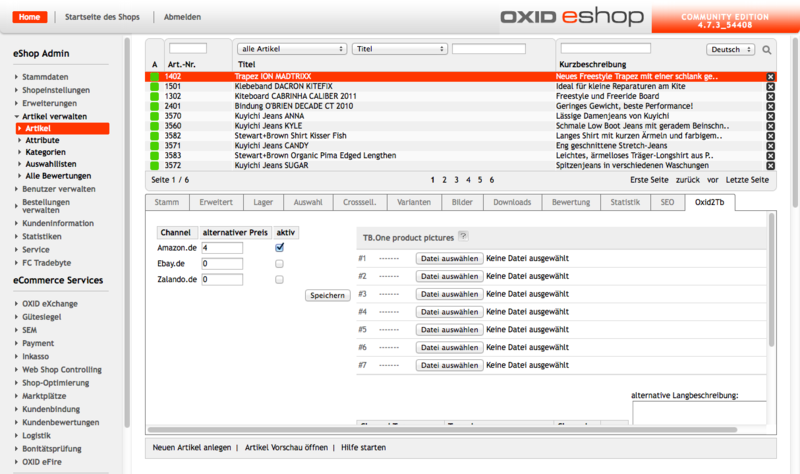 OXID eShop is your primary system for product data maintenance and you want to use Tradebyte TB.One to connect channels such as Neckermann.at or Otto.de? The FATCHIP OXID 2 Tradebyte Connector exports product data to Tradebyte TB.One in order for them to be further maintained. It is also possible to exclude individual variants from the export. 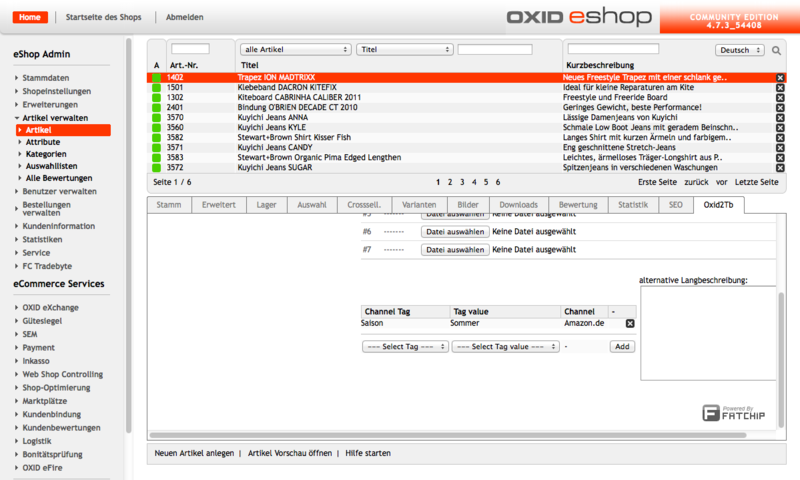 The orders placed on various channels can be imported into the OXID eShop and further processed there. SENT: When the "Send now" button was clicked in the OXID admin area or the shipping date was set otherwise, the complete order is transfered to Tradebyte as sent. COMPLETE CANCELLATION: When the "cancellation" button was clicked for a certain order in the OXID admin area or the "oxstorno" flag was set otherwise for that order, the complete order is transfered to Tradebyte as cancelled. PARTIAL CANCELLATION: When the "cancellation" button was clicked for a certain item in the OXID admin area or the "oxstorno" flag was set otherwise for that item, the item is transfered to Tradebyte as cancelled. Our plugins are delivered open-source and are tested up to PHP 7.0. Please fill out the PDF in the download section and send it - including a proof of payment - to us, preferably via email.